A great new race in one of our favorite places! The favorite running place of thousands of local runners – Manchester! I grew up in Manchester and like many, have a deep appreciation for the historic Manchester Road Race, a milestone event each November. In fact, I have run the race more consecutive years than any other woman – 40 and counting! So what could be better than bringing an HMF race to my hometown, the streets of Manchester this August? 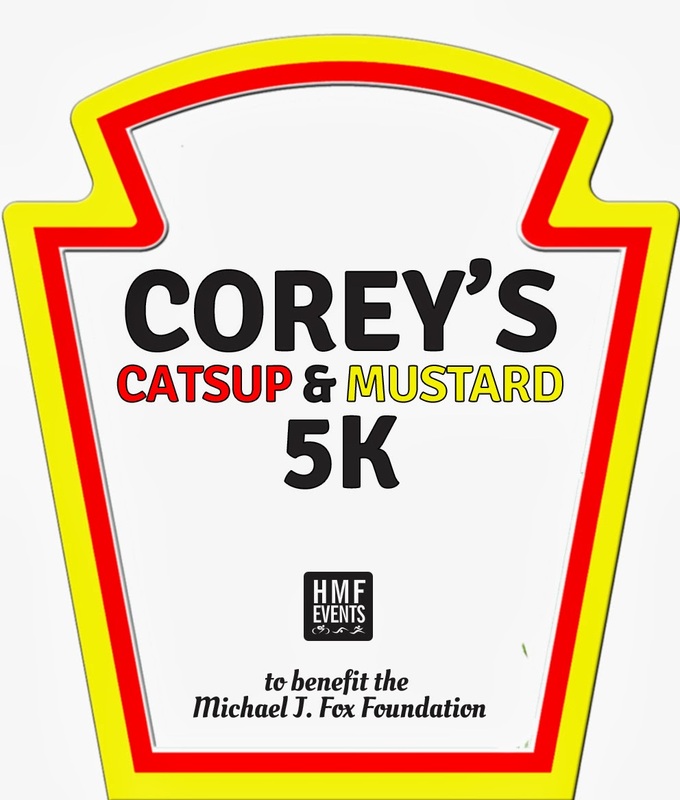 Partnering with famed Corey’s Catsup & Mustard eatery for a post-race block party on Main Street and most importantly, benefitting the Michael J. Fox Foundation for Parkinson’s Research. Corey's Catsup & Mustard 5K Run & Charity Walk will take place August 16th. 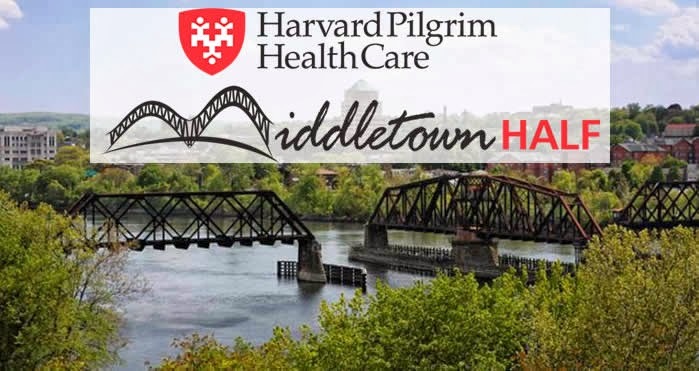 Enjoy a Saturday evening with a timed 5K run from downtown Manchester’s Main Street through a portion of the East Coast Greenway with views of historic town buildings. Bring the whole family, a non-competitive half mile walk will take place in conjunction with the 5K for those not interested in running but wanting to support the cause. This race is really not about the run. It is about adding our support to fight a disease that has personally affected so many of us – Parkinson’s. We stand with our partners at Corey’s to help the Michael J. Fox Foundation. Won’t you join us? We're offering our Facebook friends and Twitter followers $5 off for a limited time, just enter here today and tomorrow and you'll be emailed a $5 off promo to use at registration online between March 28-31. To learn more about the Michael J. Fox Foundation and their core values, click here. Thanks for your continued support! Transitioning to longer distances is both a physical and a mental process. I’ve seen plenty of good, bad and ugly ways to do it. I’ve bonked a few times and it’s not pretty. I have found the secret to not bonking again is good nutrition - a good balance of carbs and protein. When during a long run, at about mile 18, you start to see little green men or feel like you are running in clown shoes, grab a good candy bar quick. Or drink down a glass of orange juice. You need carbohydrates pronto! In the mid-18th century when I began running, I found the 3-mile mark to be my first threshold to conquer. Once beyond 3 miles, I focused on 5 miles. After I accomplished that distance, it became easier to add mileage. I think it was the psychological barriers more than physical efforts. Once I conquered 5 miles, I was a runner in my own mind. So, more distance became a function of training. Adding 10% to my weekly long run got me to the 12 mile distance. After that, I added 10% every two weeks in order to give my muscles a chance to recover and repair. Training for longer distances is all about endurance, not speed. Your pace should be easy enough to hold a conversation, and you want to make sure you’re not adding too much distance too soon. Going too fast, or adding too much distance too soon, sets you up for a far greater risk of injury. Don’t overdo!! Keeping your heart rate at about 70% of its maximum will actually increase your overall fitness by burning fat as your primary source of energy. By training your body to burn fat you’re also training it to save other energy sources it needs during harder workouts and races. It’s funny. When you go out for an 8 mile run, it feels like a long run. And it is! But when you are running a marathon and you get to the 18 mile mark, you think “only 8 more to go. Piece of cake!” That is mind over matter. The most enjoyable way to increase distance is to do it with a group or with a training buddy. The miles go by quickly and you make great friends. And finally, drink lots of water. Hydrate! For more information about Hartford Marathon Foundation training groups, please visit http://www.hartfordmarathon.com/Training/Training_Programs.htm . 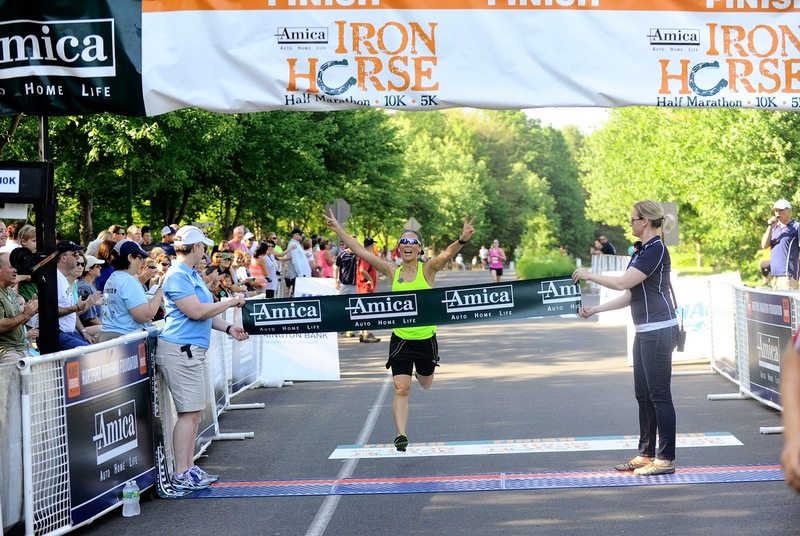 Training programs for the Shamrock 3.3 and the Amica Iron Horse 10k start this weekend! Love to run? Love to talk about running to everyone you know? We’d love to hear from you! We are creating the first-ever Team HMF, a group of 20 women and men that frequent the regional race scene while encouraging and inspiring those around them. Team HMF members will train and race their planned 2014 schedules. They will be provided perks and benefits for helping spread awareness about their experiences at events as well as the programs and services HMF offers to support runners. We want the team to be accessible to the HMF community via social media, so runners can not only follow their progress but also ask them questions and learn from the team’s experiences to help improve their running. Team HMF members will be selected based on past participation in Hartford Marathon Foundation events, social media activity and influence, community involvement and geographic location around the region including CT, MA, NJ, NYC and PA.
To be considered for Team HMF, please fill out on the online application form between today and March 20. Please contact HMF via Facebook.com/HMFevents or Twitter @runHMF with questions or for more information. The mission of HMF is two-fold. We work to empower local citizens to be healthy and fit through participation in athletic events and training programs. Our races promote and motivate people of all ages and with different interests – trail runs, triathlons, long races, short races, HMF FitKids races and many more. The other component of our mission focuses on giving back to our communities. We’re excited to announce that the Amazing Grace Food Pantry will be the official charity for our new Harvard Pilgrim Middletown Half Marathon & Legends 4-mile! The Amazing Grace Food Pantry serves 1,000 underprivileged families per month. We’re asking runners to bring non-perishable food items to donate to this worthy cause, such as mac & cheese, canned soup and peanut butter. 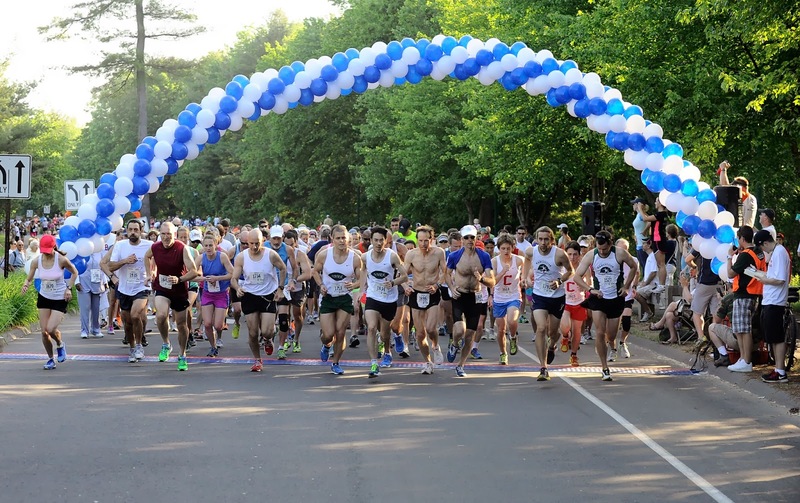 Almost every race we hold benefits charity or a cause, whether for the Connecticut community at large or smaller organizations tied to local race host towns or services. 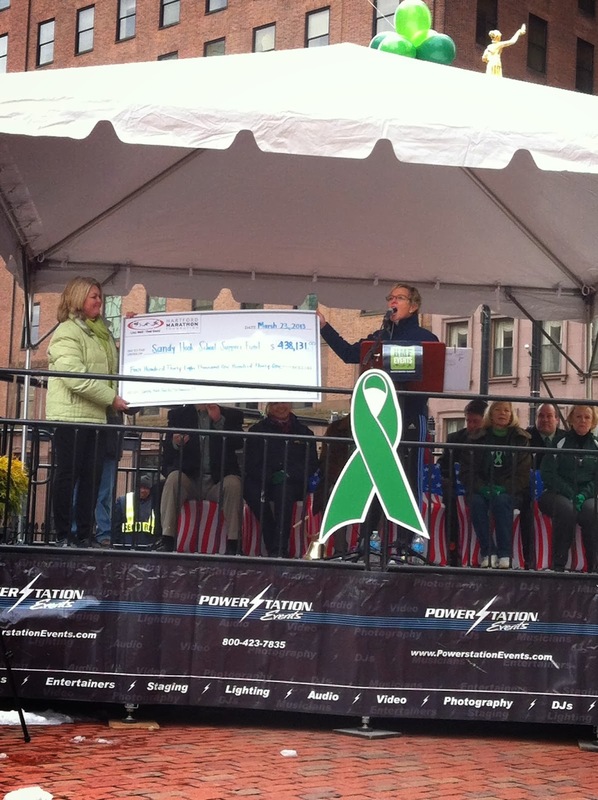 Last year, we were humbled to facilitate donations of nearly $450,000 for the Sandy Hook School Support Fund at the Sandy Hook Run for the Families in March 2013. The generosity of the HMF running community is incredible and we are happy to provide vehicles for people to give back. For the 2013 ING Hartford Marathon, our biggest event of the year, we expanded the Official Charity program making it easier for runners to raise funds for local causes. On race day, we designate a section of Bushnell Park for each official charity’s runners and volunteers, known as “Charity Village,” where their participants have a special place to relax. They even have their own private portalets (a coveted perk!). A record 21 official charities joined us on race day, some with huge teams of runners and others providing much-needed volunteers. Whether the organization’s goal was to raise funds or recruit supporters, our Official Charity program facilitated an opportunity to have a great positive impact for their causes. 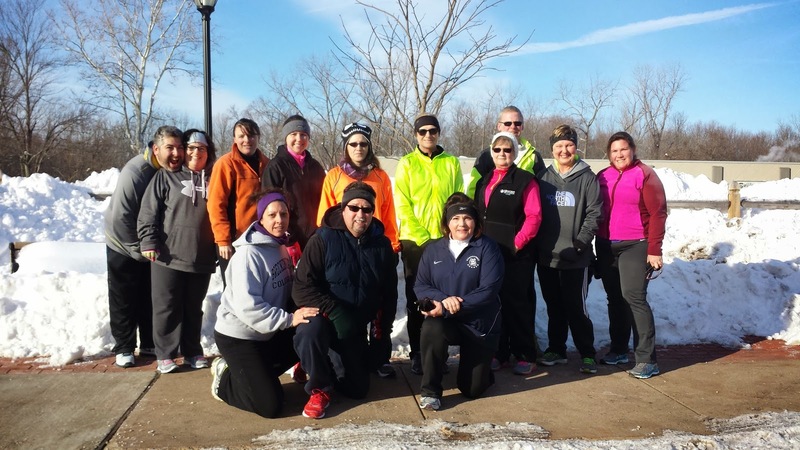 Participants in our last race of the 2013 season, the Blue Back Mitten Run presented by UnitedHealthcare, donated 3,500 new, warm mittens and raised $350 for The Town That Cares Fund, a program of the Town of West Hartford’s Department of Human and Leisure Services. This year, we plan to strengthen existing relationships with our charity partners and expand the network for giving, thanks to all the hard work and efforts of you, the HMF community. Because of your dedication, many charity groups and great causes will continue to benefit from the many miles you log in the 2014 race season.